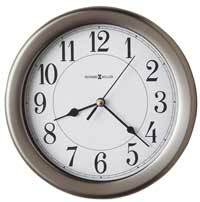 The Howard Miller Arendal II 625-551 Wall Clock is a long version of the ever popular Arendal Wall Clock. This tall, elongated 49" high wall clock features carved accents and a turned urn finial which complement the unique style. The aged dial offers black Roman numerals and decorative black hands. The long, wooden stick pendulum features an antique-brass spun bob which swings back and forth. The wooden stick swinging pendulum features an antique-brass spun bob. Requires two C sized batteries. Volume control and automatic nighttime chime shut-off option. Quartz, triple-chime Harmonic movement plays choice of full Westminster or Ave Maria chimes with strike on the hour with 1/4, 1/2, 3/4 chimes accordingly or switch to hourly only. Bim Bam chime on the hour only. Size: Height 49", Width 12-1/2", Depth 5-1/4". 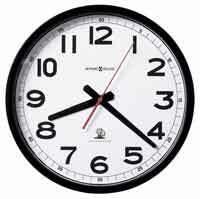 Clocks for sale at The Clock Depot including the 625-551 at discount prices.